Your first task upon entering the ballroom is to find the handsomest gentleman there, then take care to avoid him for the rest of the evening. Don’t smile at him, speak to him, flirt with him or dance with him. Don’t even tilt your fan in his direction. Sarah interviews debut author Anna Bradley, who, prior to becoming an author of historical romance was a curator and librarian for the Chawton House Library. She specialized in acquiring rare books by women writers published between 1600-1830 for Chawton House – which is way cool. We also talk about which is better: old book smell vs new car smell, vetting old books, meeting authors you admire, and whether “to librarian” should be a verb. (Spoiler alert: it should). 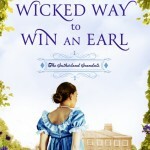 And of course we talk about her upcoming debut, A Wicked Way to Win an Earl.